This week, during a meeting of the Hudson Antiques Tea Club, I was treated to a private performance by one of my guests. 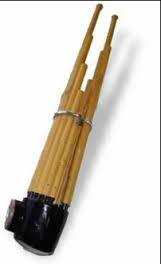 She brought with her a SHO, a traditional Japanese mouth organ, which was originally used in Japanese court music. It was a really interesting sound, with quite a high pitch. Have you ever heard this instrument? I am always very excited to find out about new instruments. I wonder if it is difficult to play . . . . ? This is not the lady I met, but here is a link to someone demonstrating the Sho that I found on youtube.